As you rest, both your body and mind undergo a significant recovery process. Sleep actively restores your brain, helping you form and consolidate memories and even flushing out toxins that could lead to Alzheimer’s. It also decreases your risk factor for a number of health concerns including diabetes, high blood pressure, obesity and depression. 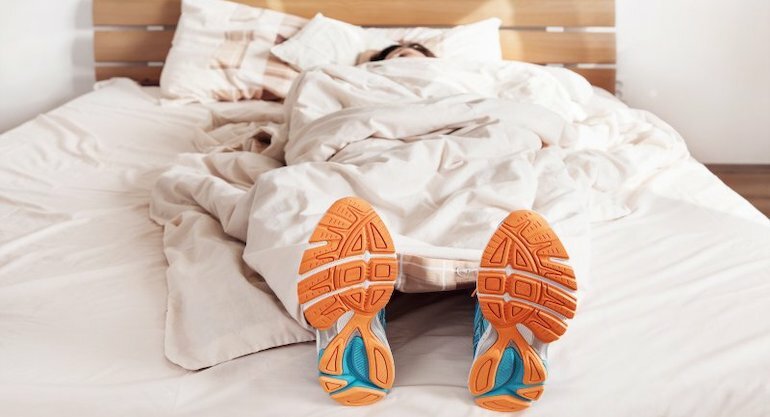 In addition to restoring your brain, sleep is also the key to effective post-workout recovery. It works to repair your muscles after the damage caused by a workout and recharge your body, making you stronger and more fit over time. When you workout, your muscles are taxed and broken down — and it’s the “rebuilding” of the muscles in recovery that causes them to grow, allowing you to place more and more stress on them as you get stronger. This adaption, however, doesn’t take place when you’re lifting weights. It occurs when you’re resting. If you still need some convincing, sleep as a means for recovery has recently been stressed in the world of collegiate and professional sports. Last year, the Interassociation Task Force on Sleep and Wellness convened to develop recommendations to inform best practices and educational resources in support of the sleep wellness of college athletes. Additionally, it is reported that Lebron James averages 12 hours of sleep per day, and that Usain Bolt and Serena Williams average ten. The priority that some of the world’s greatest athletes place on sleep should give you some indication of the fact that it is an absolutely critical factor in top physical performance! Actually allow for 7-8 hours of sleep. This is called “sleep opportunity,” which simply means giving yourself an adequate amount of time to actually be asleep. Many of us don’t fall asleep the moment we lie down. If you typically go to bed at 11pm and wake up at 7am for the day, applying this principle might look like getting ready for bed at 10pm, and turning off the lights at 10:30pm. This will give your body far more time to wind down, so you actually spend eight hours sleeping. Your body temperature naturally lowers as you sleep, so making sure your bedroom is nice and cool will improve sleep quality. Keep your room between 60-68 degrees Fahrenheit. Make sure your bedroom is as dark as possible. Even the light from an alarm clock can inhibit your sleep quality. If you live in an apartment complex and don’t have control over the lights that reach your bedroom, use a sleep mask. Turn off all of your electronic devices about an hour before you plan to go to sleep. TVs, phones, computers, tablets, and the like all emit a blue light that has been shown to reduce the brain’s production of melatonin, the sleep hormone. Unfortunately, if you have an undiagnosed or untreated sleep disorder like sleep apnea, a good night’s sleep may be out of reach even if you allow yourself adequate sleep opportunity. That’s because sufferers of sleep apnea — a condition in which the body temporarily stops breathing during sleep — may not even be aware that they are experiencing multiple microarousals from sleep each night, and are so used to the feeling of sleep deprivation that they’re unable to remember what it’s like to be fully well-rested. If you have untreated sleep apnea, you’ll never fully recover from your workout — and continuing to push yourself despite reaching full recovery could even set your body up for more damage. The good news is that sleep apnea is relatively simple to treat. Are you interested in learning more? Contact our office or schedule a free consultation online with our experienced dental sleep medicine practitioner Dr. Jeff Rodgers to get started on the path to quality sleep and renewed health. We’d love to see you reach all of your fitness goals this year through improved sleep!